The branch line from Brockenhurst to Lymington makes regular connections to SR services Weymouth - Waterloo. It is a short walk from the station to Cannon Street. From Junction 1 of the M27 follow the A337 through Lyndhurst and Brockenhurst to Lymington. At the lights, turn left into B3054 (Avenue Road), then right into New Street. Left into Cannon Street. Parking at the Centre is limited to their members and staff. 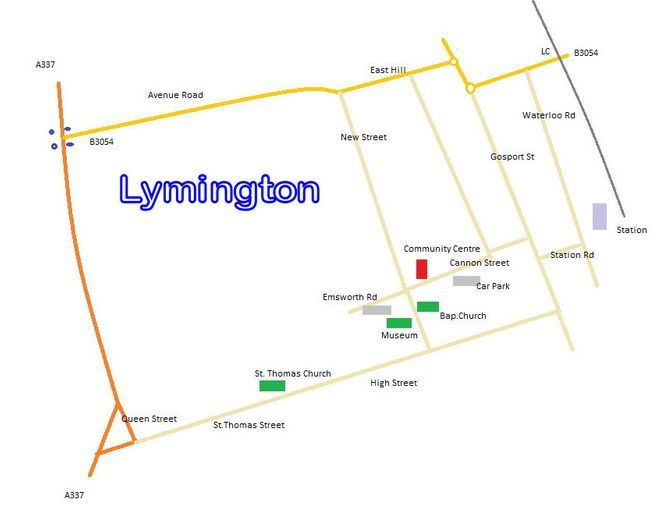 There are public car parks nearby in Emsworth Road and Cannon Street. Follow the A337 and turn into the High Street (via Queen Street and St.Thomas Street). From the High Street turn left into New Street, passing St.Barbe Museum and the Baptist Church. Parking as above. From Hythe and Beaulieu the B3054 crosses the rail line. Turn right at the first roundabout and left at the next to reach East Hill, then left into New Street, left turn again into Cannon Street. Use postcode SO41 9BR, not the one for the Community Centre.